VLADIVOSTOK, May 18. /TASS/. A cargo-passenger ferry service linked the North Korean port of Rason to Russia’s Far Eastern city of Vladivostok on Thursday. 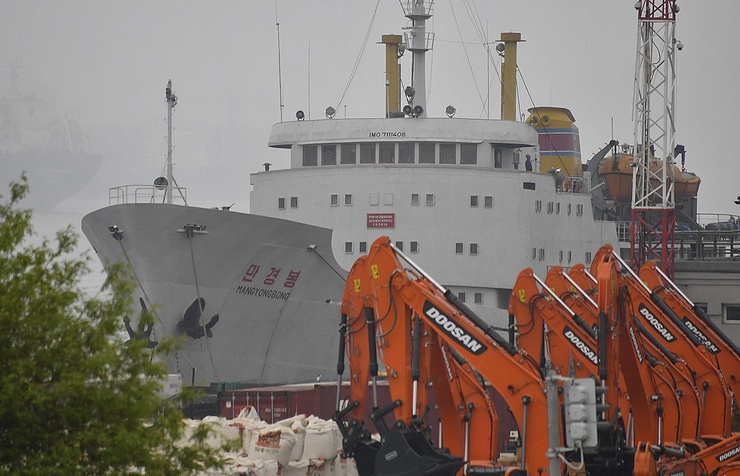 The Man Gyong Bong ferry left the Rason port on Wednesday’s evening and arrived in Vladivostok at 8.00 a.m. local time on Thursday, carrying around 40 passengers. "These are Russian citizens, who are returning from North Korea, and tourists from China. The vessel will be on the way back on May 19," said Mikhail Khmel, deputy director general of Investstroytrest. The company owns RosKor, which is the route’s operator. The ferry route will operate once a week. The company expects that most of its passengers will be Chinese tourists, which will be able to visit both Russia’s Primorye region and North Korea during one trip. "Now in China tour operators already provide tour packages with our cargo-passenger service," Khmel said, adding that the ferry will carry cargos, mostly food. The Man Gyong Bong ferry was built in 1971 and underwent modernization last year. It can take aboard up to 200 passengers and about 1,500 tonnes of cargo. The ferry has 40 cabins, a restaurant, two bars, a shop, a sauna and a room for karaoke. "The opening of the ferry service between Vladivostok and Rason will certainly contribute to expanding economic and human contacts between Russia’s Far East and North Korea. Now these contacts are rather limited due to the lack of transport infrastructure," said Artyom Lukin, Assistant Professor at Far-Eastern Federal University’s School for Regional and International Research. A regular cargo-passenger service will link the ports of Russia and North Korea for the first time. Even during the Soviet time, when the ties between the USSR and North Korea were more active, there weren’t any cargo-passenger services between Vladivostok and North Korea, he said. Until now transport connections between Russia and North Korea were only possible by the air (two flights per week between Vladivostok and Pyongyang performed by Air Koryo) and by railways via the Hasan station. The opening of the ferry service may attract more tourists to the Far Eastern region. "Now this is the only passenger ferry service between North Korea and the rest of the world. Citizens of many other countries, who are interested in North Korea, may be among those, who want to use the ferry services, besides the Chinese and Russians," Lukin said.